Definition at line 48 of file MessageFile.h. Definition at line 116 of file MessageFile.cpp. Definition at line 122 of file MessageFile.cpp. Definition at line 358 of file MessageFile.cpp. Definition at line 127 of file MessageFile.cpp. Definition at line 240 of file MessageFile.cpp. Referenced by CREMapInformationManager::checkEvent(), CREMapInformationManager::loadCache(), and CREMessagePanel::setItem(). Definition at line 172 of file MessageFile.cpp. References convert(), Settings::datadir, lists, Settings::mapdir, MessageRule::MessageRule(), MessageRule::setComment(), MessageRule::setInclude(), MessageRule::setMatch(), MessageRule::setMessages(), MessageRule::setPostconditions(), MessageRule::setPreconditions(), MessageRule::setReplies(), and settings. Definition at line 132 of file MessageFile.cpp. Referenced by MessageManager::findMessage(), CREUtils::messageNode(), CREMessagePanel::setItem(), and CREQuestPanel::setItem(). Definition at line 235 of file MessageFile.cpp. Referenced by CREMessagePanel::currentItemChanged(), CREMessagePanel::currentRuleModified(), CREMessagePanel::onAddRule(), CREMessagePanel::onDeleteRule(), CREMessagePanel::onDuplicate(), CREMessagePanel::onMoveDown(), CREMessagePanel::onMoveUp(), CREMessagePanel::setItem(), and CREQuestPanel::setItem(). Definition at line 318 of file MessageFile.cpp. 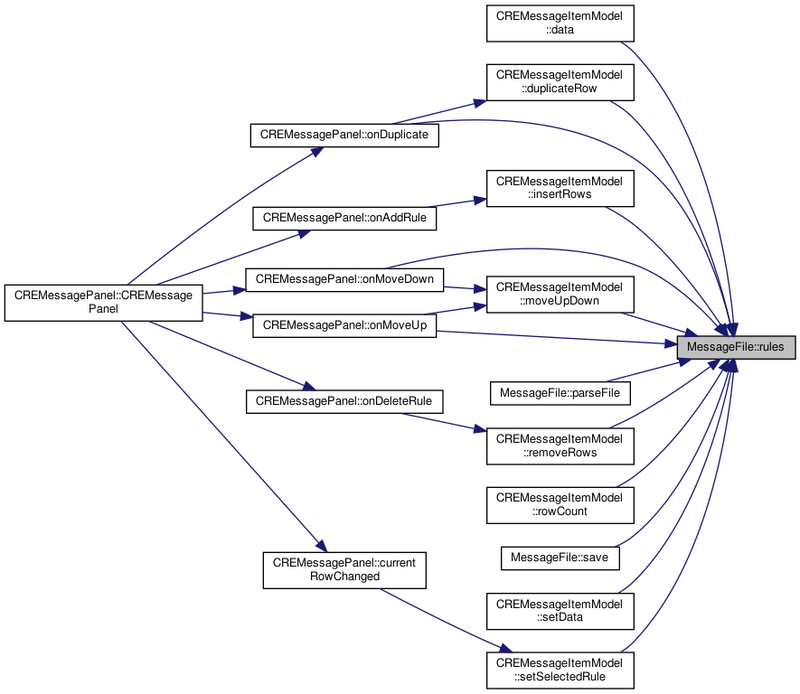 References convert(), Settings::datadir, MessageRule::isModified(), Settings::mapdir, MessageRule::myIsModified, MessageRule::setModified(), and settings. Definition at line 146 of file MessageFile.cpp. Definition at line 363 of file MessageFile.cpp. 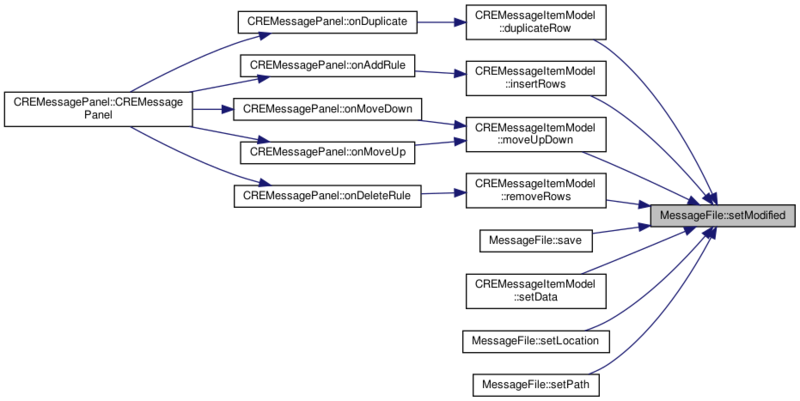 Referenced by CREResourcesWindow::addMessage(), CREMessagePanel::onMoveDown(), and CREMessagePanel::onMoveUp(). Definition at line 137 of file MessageFile.cpp. Definition at line 73 of file MessageFile.h. Definition at line 75 of file MessageFile.h. Definition at line 77 of file MessageFile.h. Definition at line 74 of file MessageFile.h. Definition at line 76 of file MessageFile.h.